1. Reserve Bank of India (RBI), vide its Notification No. RBI/2016-17/283; BP.BC. No. 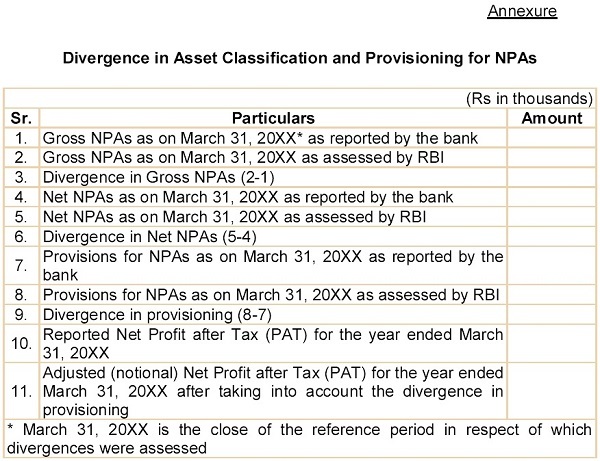 63/21.04.018/2016-17 dated April 18, 2017, requires disclosures by banks in a prescribed format in certain cases of divergence in the asset classification and provisioning. The Notification requires the disclosures to be made in the Notes to Accounts in the ensuing Annual Financial Statements published immediately following communication of such divergence by RBI to the bank. b) The disclosures shall be made in the format specified in the Annex to the aforesaid RBI’s This format is also placed as Annexure to this circular for reference. c) The disclosures shall be placed as an Annexure to the annual financial results filed with the stock exchanges in accordance with clause (d) of sub-regulation (3) of Regulation 33 of SEBI (Listing Obligations and Disclosure Requirements) Regulations, Such disclosures shall be made along with the annual financial results filed immediately following communication of such divergence by RBI to the bank. 4. This circular is issued under Regulation 101 of SEBI (Listing Obligations and Disclosure Requirements) Regulations, 2015. 5. This circular is available on SEBI website at www.sebi.gov.in under the categories “Legal Framework/Circulars”.